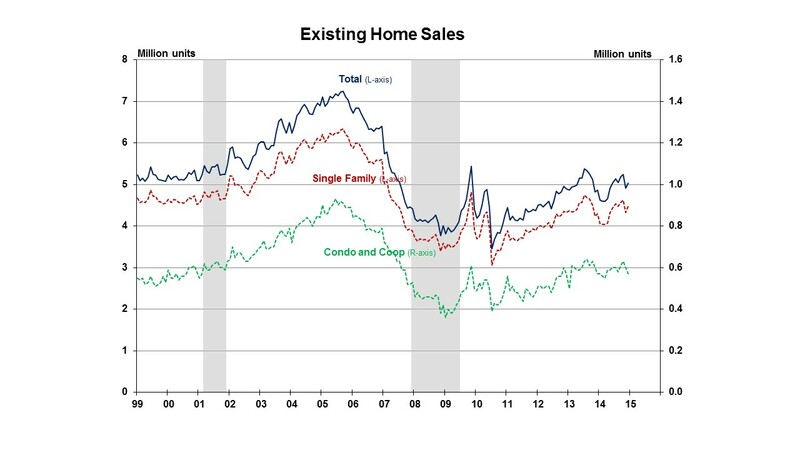 Completing an improved second half of 2014, existing home sales increased 2.4% in December, although the share of sales for first-time buyers continued to disappoint. Existing home sales exceeded a 5 million sales pace for the sixth time in the past seven months, and were 3.5% above the same period a year ago. The National Association of Realtors (NAR) reported December 2014 total existing home sales at a seasonally adjusted rate of 5.04 million units combined for single-family homes, townhomes, condominiums and co-ops, up from 4.92 million units in November. Existing sales from the previous month were up 12.5% in the West and 4.9% in the South, but were down 1.8% in the Northeast and 3.8% in the Midwest. Year-over-year, the South was up 7.9% in December, the Northeast was up 3.8% and the West was up 3.1%. Only the Midwest was down from the previous year, some 1.9%. The first-time buyer share decreased to 29% in December from 31% in November. The first-time buyer share averaged 29% in 2014 for the second straight year. The annual share of first-time buyers fell to its lowest level in nearly three decades. Reports of easing mortgage standards will help first-time buyers, and a full recovery awaits their return to their typical 40% share. Total housing inventory decreased 11.1% in December to 1.85 million existing homes. At the current sales rate, the December 2014 inventory fell to a 4.4-month supply from a 5.1-month supply in the previous month. NAR also reported that in December the typical time on the market was 66 days, only a slight increase from 65 days the previous month, and down from 72 days during the previous December. NAR reported that 31% of homes sold in December were on the market less than a month, down slightly from 32% in November. The distressed sales share increased to 11% in December from 9% in November, but was down from 14% during the same month a year ago. Distressed sales are defined as foreclosures and short sales sold at deep discounts. December all cash sales increased to 26% of transactions from 25% in November, but were down from 32% during the same month a year ago. Individual investors purchased a 17% share in December compared to 15% in November, but were down from the 21% share of December 2013. Some 63% of December investors paid cash, compared to 61% in November. The gradual withdrawal of cash investors will create more opportunity for first-time buyers. The median sales price for all of 2014 was $208,500, the highest since $219,000 in 2007 and up 5.8% from the $197,100 in 2013. The December median sales price of $209,500 was 6.0% above the same period a year ago, and represented the 34th consecutive month of year-over-year price increases. The median condominium/co-op price increased to $204,000 in December from an upwardly revised $202,000 in November, and was up 3.2% from the same period a year ago. The Pending Home Sales Index increased 0.8% in November, supporting continuing momentum for existing home sales into 2015. However, the first-time buyer share continued to disappoint.